With a little luck and the help of the generous deposit bonuses offered at Slotastic, one player at the US-friendly online casino turned a $25 deposit into $1577 last month. With an extra $400 deposit bonus available through March, and a $1000 Guaranteed Slots Tournament next week, others will likely beat that this month. James S. from Pennsylvania deposited just $25 at the beginning of February. His deposit bonus doubled that and gave him lots more time to enjoy at slot machines such as Crazy Vegas, Honey to the Bee, or Hidden Riches. By the end of the month he had $1,576.93 in his account. In addition to the $200 Monthly Paycheck Bonus, $100 Progressive of the Month Bonus, $100 Slot of the Week Bonus and $100 Midweek Madness Bonus already available, Slotastic is offering an amazing $400 deposit bonus this month. The coupon code required to claim this free money is “MARCHWINNER”. After entering the coupon code in the Cashier’s “Redeem Coupon” section, a 100% deposit bonus up to $400 will automatically be credited to players’ accounts. Tournaments are a great way to win big prize money without risking much cash. The entry fee for the Enchanted Garden tournament being held next week at Slotastic is only $1, yet the player who wins the most playing the Enchanted Garden slot machine between March 18th and 21st will walk away with $1000, guaranteed. Registration begins march 16th and players can enter more than once to try and top their own score. Enchanted Garden is a 20 payline slot machine with a fairy princess, a unicorn and a magical firefly spinning on its five reels. A special scatter symbol multiplies wins up to 200x. 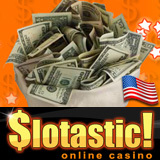 Slotastic has some of the biggest progressive jackpots at currently available to American players. Jackpot Pinatas is over $1.6 million, Aztec’s Millions is over $1.2 million and the Midlife Crisis/Shopping Spree is just over a million. Cleopatra’s Gold is worth over a quarter million. Slotastic.com is a full-featured online casino with games and promotions designed especially for online slots enthusiasts. Players from around the world, including America, are welcome.